Movies in Clark Park Audience Choice! UCD, Cedar Park Neighbors, and local mural and fine art company Hagopian Arts are working together to install a ground mural at Cedar Park, and we want your input! Help us choose between three nature-inspired mural designs. The winning design will be added to the small plaza at the eastern edge of the park. As the West Philadelphia Skills Initiative (WPSI) expands in the months ahead, the team is building new approaches to the program model in order to better serve both employer partners and jobseekers. This month, Green City Works officially turns 3! Since launching, our landscaping social venture – created to provide job opportunities to talented local residents – has succeeded beyond our wildest hopes. What began as a marriage of our core areas of expertise in placemaking and job training has turned into a landscaping business that serves over 35 commercial clients across Philadelphia and manages over 1.5 million square feet of green space. Happy spring! In April we're welcoming back a full slate of food trucks vending lunch each weekday. 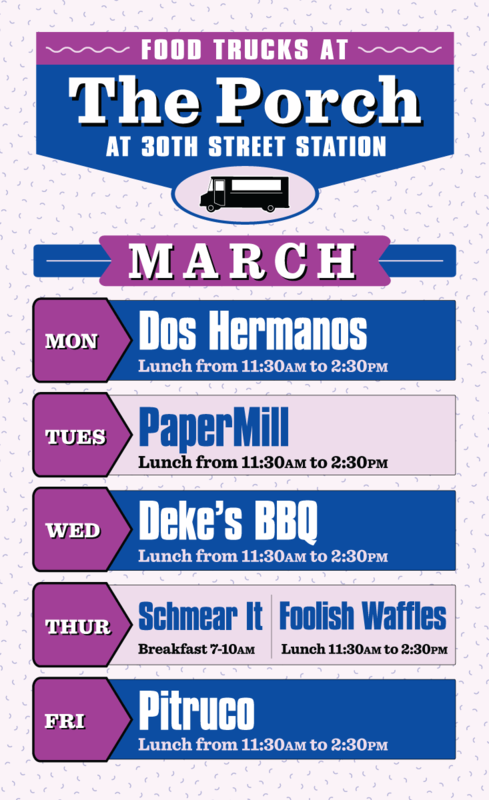 In April we're bringing in five brand new trucks to The Porch, plus breakfast each Thursday morning from Schmear It. See below for descriptions of each truck and the full schedule. We hope you'll join us for lunch as the weather gets nicer! Make sure to keep an eye on our Twitter page for updates and cancelations, and stay tuned for news on performances and other new amenities coming to The Porch! University City District (UCD) and the Baltimore Avenue Business Association are excited to announce the return of the Baltimore Avenue Dollar Stroll on Thursday, June 6th and Thursday, September 12th, 2019. The event draws thousands of neighbors and visitors to enjoy $1 specials from participating vendors. Help keep your neighborhood clean by joining a community cleanup on Saturday, April 6th from 9 AM to 2 PM. UCD is partnering with the City of Philadelphia to assist block captains, students, volunteer groups and neighbors by providing trash bags, brooms, work gloves, and trash pickup. To sign up and join the effort, please contact us via email or by calling 215-243-0555. For the better part of 20 years, University City District fit the para­digm of most Business Improvement Districts (BIDs), working every day to make our 2.4 square mile district cleaner, safer, greener and more enticing for both retailers and developers. We think of this work as investing in a neighborhood’s infrastructure, both literal and figurative: the foundational infrastructure of clean and safe streets, the commercial infrastructure of bustling retail districts and the civic infrastructure of thriving common spaces. Daily lunch service returns in March at The Porch! We have a different truck vending each day for lunch, plus breakfast service from our friends at Schmear It on Thursday mornings. Make sure to keep an eye on our Twitter page for updates and cancelations. We'll be sharing announcements about more programming and exciting changes coming to The Porch soon! You may have noticed some new additions to the streetscape on the south side of Chestnut Street between 38th and 39th Streets. Affectionately nicknamed “The Spaceship” by Post Brothers, the site’s developers, the decidedly modern architecture of Hamilton Court’s recently completed amenity center is hard to miss. The eye-catching design is meant to draw the gaze, while the ground-level commercial space is intended to activate street life on a previously quiet stretch of Chestnut Street. The support of local civic associations has been critical to UCD’s work since our formation in 1997. Early in our history, the civics served as a bridge between UCD and the neighborhoods they serve, helping to amplify our mission with the community. Our Board of Directors has always included one representative from each association, ensuring the needs of the community are given voice and priority within University City. Each month we aim to highlight theater, art, music, food, and tech events happening in University City. Want your event listed? Email us to get your organization added to our mailing list! See below the list of events for a round-up of MLK Day volunteer opportunities. The West Philadelphia Skills Initiative (WPSI), our nationally renowned job training program that connects local residents seeking opportunity with employers seeking talent, enjoyed a busy end to 2018. The Skills Initiative completed several cohorts, began recruitment for more, and made exciting staff changes that will help our program grow and reach our goal of serving 400 participants a year by 2021. 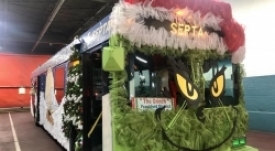 Festive Events at Trolley Portal Gardens! This December we're helping to celebrate the holidays at Trolley Portal Gardens! Each month we aim to highlight theater, art, music, food, and tech events happening in University City. Want your event listed? Email us to get your organization added to our mailing list! Help keep your neighborhood clean by joining a community cleanup on Saturday, December 1st from 9 AM to 2 PM. UCD is partnering with the City of Philadelphia to assist block captains, students, volunteer groups and neighbors by providing trash bags, brooms, work gloves, and trash pickup.